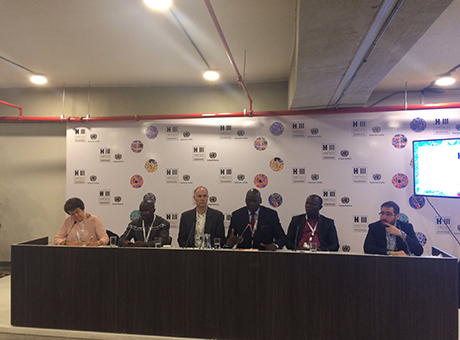 Dr Andrea Rigon and Dr Alexandre Apsan Frediani coordinated and supported a delegation from Freetown (Sierra Leone) at the UN Habitat III conference. The delegation included Sam Gibson, Mayor of Freetown, Sulaiman Parker, the Environment and Social Officer of Freetown City Council and the two co-directors of the Sierra Leone Urban Research Centre (SLURC), Dr Joseph Macarthy and Braima Koroma. SLURC is a research centre created through a partnership between the Bartlett Development Planning Unit and Njala University with the aim of generating knowledge that could bring together city actors to achieve just urban development. Sierra Leone is one of the countries with the lowest Human Development Index and is facing a process of urbanisation which has the potential to improve the well-being of its citizens. On Sunday, the delegation participated to the World Mayors Assembly. Mayors of the world strongly asked to be recognised as the central actors in the implementation of the New Urban Agenda and asked for more powers, particularly in terms of direct access to finance mechanisms. There was also a mayor call for more women in local government leadership. The Mayor of Freetown had the opportunity to informally meet with UN Secretary General Ban Ki Moon and put the needs of cities in least developed countries on the political agenda. On Thursday, SLURC was launched internationally through a press conference to explain how it operates as an urban learning alliance introducing a new mode of urban knowledge production through partnerships with central and local government, universities, civil society organizations, and local communities. The following people explained the importance of an organization such as SLURC. Mr. Sam Gibson, Mayor of Freetown, Mr. Francis Reffell, YMCA Sierra Leone, Dr. Joseph Macarthy, SLURC co-director of SLURC, Prof. Julio Davila, Director of Bartlett Development Planning Unit, University College London, Dr. Irene Vance, Comic Relief. A detailed outline of the SLURC delegation activities can be read on our blog by Andrea Rigon.